Welcome back to DIY Wednesday. 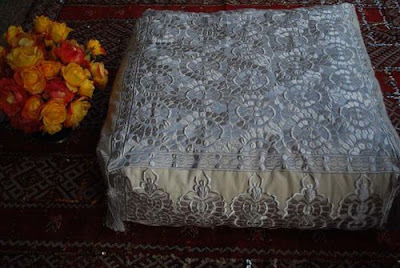 Today we will be making a Moroccan pouf out of an old party dress. And best yet - it doesn't have to cost one cent. This pouf project is inspired by the Moroccan style ottomans that have been popping up like toadstools all over design magazines and blogs. This is partly because Moroccan design is hot right now. But it's also because poufs are a pretty useful little piece of furniture, especially for an apartment dweller like myself. 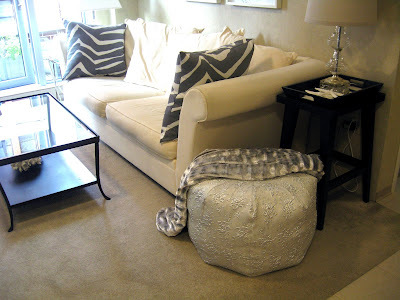 A pouf can double as a footstool, side table, coffee table, extra seating and even storage. 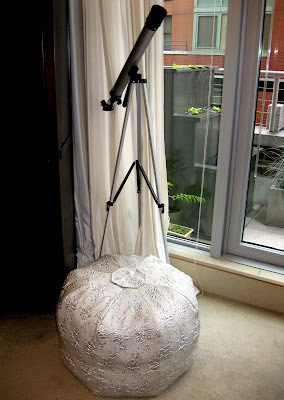 Below are two of my inspiration poufs, one from John Derian and the other from My Marrakesh. 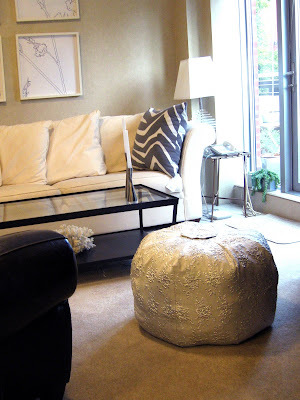 For more Moroccan pouf inspiration, check out Anne Sage's post at The City Sage. 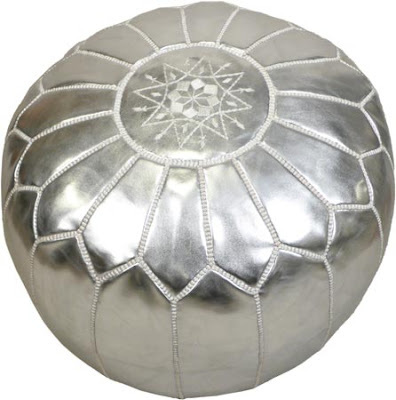 Here's the catch - Moroccan poufs can cost anywhere between $70 and $325, too much for this frugerati decorator. While pondering my knock-off dreams, it has occurred to me that Moroccan style shares a certain vibe with party dresses - jeweled tones, sparkly embellishments and overall shimmer. Poufs are pricy. Party dresses are plentiful and cheap. Americans discard 10 million tons of clothing a year. I see outdated party dresses, bridesmaid dresses and assorted other blingy attire hanging for weeks in thrift stores before being sent off to their final resting place - some landfill. To make a large pouf (15 inches tall by 22 inches wide) you will probably need two party dresses. (A set of heinous bridesmaid dresses would be perfect.) 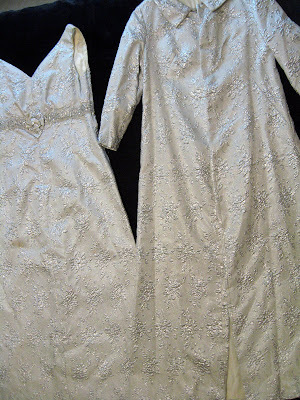 In my case, the dress came with a full-length jacket of the same fabric, which provided just the right amount of fabric. You are a villainess from The Chronicles of Narnia. So, I like to think I am honoring the dress by rescuing it from sure destruction and turning it into something useful. A bunch of paper, rags, fabric remnants, old blankets, etc. for stuffing your pouf. First, we will make a pattern for our pouf. My pouf design is made up of eight sections sewn together in the shape of a pincushion. Using pi (remember pi? ), you can make any size of pouf you want. Or you can use my pre-calculated pouf pattern available here. 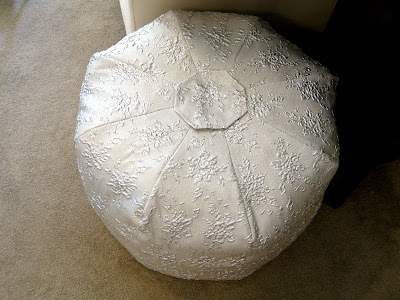 A large pouf will be about 15 inches tall by 22 inches wide. A small one will be about 8 inches tall by about 18 inches wide. 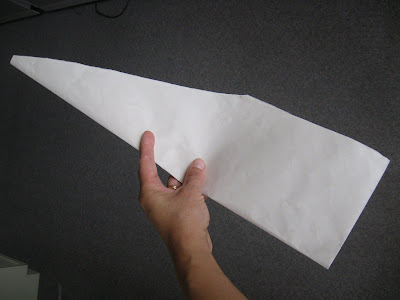 Your paper pattern, when folded, will look like this. 1. 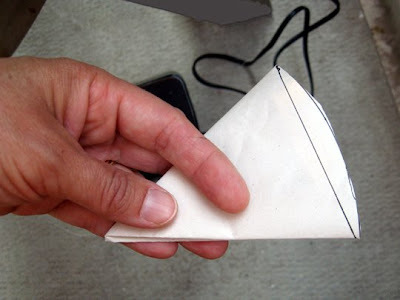 Unfold your paper pattern and pin it to your party dress. If your dress has a lining, include the lining as well. Cut out a section. (You may have to get creative about placing your pattern pieces so that you have enough fabric for a complete piece.) Continue until you have cut out eight sections. 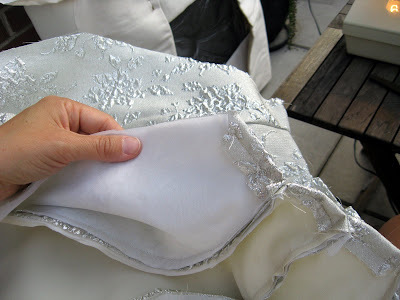 Save any scraps, snaps or embellishments from the dress. 2. For each of the eight sections, measure down about three inches from one tip, fold and sew in place. This will eventually create a hole at the top of your ottoman to allow for stuffing. 3. Pin two sections together, wrong side out, and sew along one edge using a 1/2 inch seam. Sew the remaining sections together along one edge in sets of two. Sew each set of two along one edge into sets of four. Sew your two sets of four together along both edges. 4. Pull the fabric through the hole at the top of the ottoman to turn it right side out. 5. Stuff your ottoman with whatever is available. I found mine made a great storage location for the wads of fabric I keep around for future projects. 8. 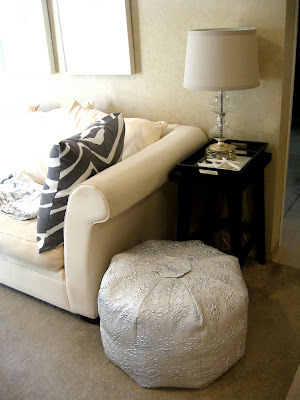 Optional: Decorate your ottoman with any sequins or other embellishments from the dress. Note: the large ottoman is quite large. In fact, I fell to the ground in shock and dismay after stuffing my pouf and realizing it turned out exactly the size I had measured and almost the same size as John Derian's, which also happened to be an enormous size in my wee apartment. Stuffed with rags, it is also heavy as a month of dirty laundry. That is why I have included several pictures of it finished so that you will not be surprised if your little project turns out to be Jabba the Hut. On the other hand, it is tall enough to be a side table and provides a nice comfy seat. But if you're just looking for a place to put your feet up, go for the smaller pouf. No way! You are brilliant and so is your pouf. And it looks perfect in your room. Well done, I say, well done. Wow! I'm really very impressed! The fabric is spot on (the photo of you in the dress is HILARIOUS) and the execution is not bad at all. Nice work! Wow, this is gorgeous! I know I'll be searching for a dress for this project. I can't wait! I'll be linking as well. This project totally rocks my socks. Amazing! Wow! Great DIY project... where' you find the time! Just added you to the blogroll. Amazing! I really really want to make one... by the time I find the time poufs will have probably gone out of fashion (again) and come back around (again) - but I swear I will get there! Holy smokes, is this smart?!? Wonderful job indeed! The project actually wasn't that bad. It took me about four hours, and I am by no means a talented seamstress. it adds a little glamour to the space. very nice diy. You're a rock star. The original dress was scary as hell, well done giving it a new life. Fabulous project! And a clever way to turn the OTT dress into something lovely to live with. You are so clever and very, very funny! I am visiting via Hooked on Houses. I'd never heard of a pouf. But you didn't just make a pouf; you made a POUF!!! P.S. "pre-calculated pouf pattern" is the best alliteration I've seen in a good while. What a great project! Too fab. I would love to do that to my wedding dress. I was wondering what I could do with it besides sell it. I don't want to frame it. But a large pouf would be great. It would make a conversation piece. This was exactly the type of instruction I was looking for - fantastic job at explaining. Thanks so much for sharing!! Thanks so much for this! I'm off to start on one as soon as I get back from the office! LOVE it! I just ordered some the other day from ebay. Kind of nervous to see what I get! This is a hilarious post - I love the tutorial; but even more you've had me laughing throughout! Thank you and I'm sure to start following you now. Found you via Absinthe & Orange (blog). I finally made a version of this using your pattern! Thanks for the good instructions! Yay. Hope you made the smaller one. The big one is a chunk. awesome...love to recycle and reuse the entire garment, and have been making cushion inserts with the waste from my serger and small snips, but how many cushions can one house have?? !...thank you for a gorgeous project! Oh my word, this is exactly what I've been looking for. It's utterly brilliant! Thanks for sharing. I wanted to let you know I shared a link to this post on my blog today. 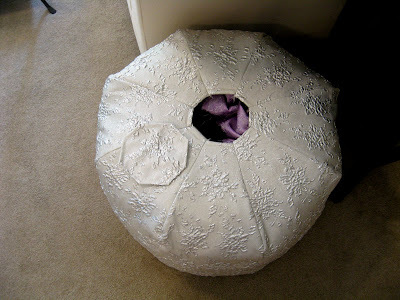 We're hosting a pouf sew-a-long (aka a Pouf-A-Long) and I suggested your pouf tutorial as a great one to try. You're more than welcome to join the party on July 20, if you'd like! Absolutely Fantastic! I was thinking about shelling out over $100 for one but not anymore! I'm going to have a go at making the small ottoman...might have to search the charity shops for some amazing material though...I have a peacock coloured themed lounge..so purple, green teal etc...thanks for a great pattern.. I was just chuckling and sharing this with my daughter. So glad I came across this pattern for free, and now I don't have to throw away clothes not fit for the thrift store. I'll use them for stuffing instead! Love the designs and the post. I really appreciate the post. I love this project and especially the reuse of fabric scraps and old rags. 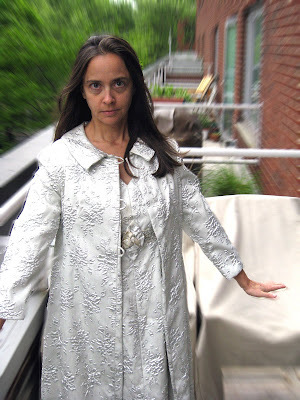 This link was sent to me by a friend who wants me to make one; my question is if they choose to not to use old dresses and rags, how much fabric would they need to purchase? No hole on the bottom. The "wedges" all come together like slices of a pie. Hope that helps. Would love to see how yours turned out when you're done. I have a hole on the bottom...your instructions never said to make the bottom different from the top.Now I've got to undo it and sew it all over. I'm using pillows for stuffing, but I'm not sure how to stuff them through the hole at the top. Maybe it's me...I'll keep trying. I'm almost done. I took it apart and closed up the bottom, and I've stuffed four down filled pillows in it and it needs more stuffing. I'm tired. Oh my goodness. You're working on it at 12 a.m. I would jump out the window. Oh My God!! What a Pretty Pouf!! It's really AWesome!! The photo of you in that dress and coat made my day. They're huge on you and your expression is priceless. The fabric however, is beautiful. Aren't you clever! Somewhere I read about stuffing a homemade pouf with extra bedding and pillows. There was large access via the bottom. Yes, you can use the stuffing from an old duvet or pillows. I think Elizabeth Abernathy did that on her blog.